Change begins with learning . . .
By partnering with the Santa Barbara Public Library System, the Santa Barbara City College Luria Library, and with generous support from Patagonia, UCSB Reads expands on the campus common reading experience to encompass the entire Santa Barbara community and beyond. This award-winning program engages the communities through conversations, lectures, readings, displays, and other activities that explore interdisciplinary issues which arise from the selected read. Copies of the book are distributed free to interested students, and faculty are encouraged to incorporate the book into their class curricula. Generate informed discussion of key issues by promoting the reading and discussion of books on the specific theme of globalization. Encourage the exchange of ideas among members of the campus and Santa Barbara communities through broad community partnerships such as with Patagonia, Santa Barbara City College and the Santa Barbara Public Library System, and to share a common intellectual experience. Create further campus appreciation of the library and the role it plays in education and research. Create a strong relationship between the EVC's office and the library as we welcome a new University Librarian to campus. Support a theme of UCSB's strategic plan and highlight the creation of four endowed Mellichamp Chairs in global issues. Highlight academic strengths in economics, political science, sociology, and global and international studies. Create a sense of fun and camaraderie on campus while addressing an important issue. This year's theme is Globalization and Global Citizenship and the book chosen for discussion, Travels of a T-Shirt in the Global Economy by Pietra Rivoli, illustrates the major issues of the globalization debate by exploring the life story of a simple t-shirt. Over 2,000 free copies of the book will be distributed to UCSB students beginning January 15, through the efforts of the UCSB Libraries. 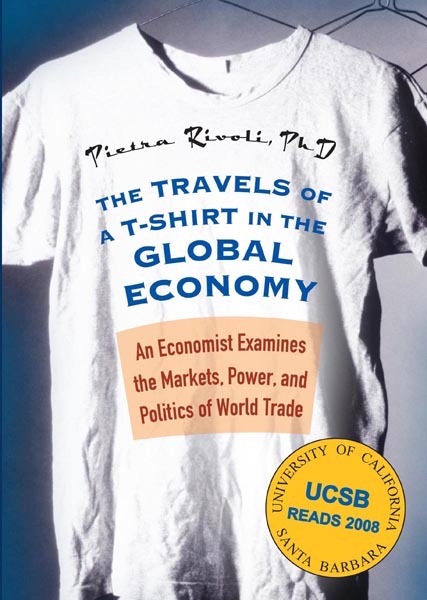 Discounted copies of Travels of a T-Shirt in the Global Economy are available now at the UCSB Bookstore. The Santa Barbara Public Library System offers an audio book version which you can download and hear it read. After you finish reading the book, redistribute your copy to another reader! There will be a collection box in the Davidson Library for this purpose. A chance to clean your closets! As part of the UCSB Reads program this year on globalization (and because the selected book this year is Travels of a T-Shirt), we are launching a used t-shirt drive at the library. We have a box set up in the main lobby of Davidson Library for collecting clean, used t-shirts. The shirts will be used in a UCSB art project lead by Professor Kim Yasuda. Any t-shirts not used for the project will be donated to charity. Faculty and students will be exploring the multi-disciplined issues and topics covered in the selected book. Community events related to the book will include lectures, panel discussions, and workshops. Check the Events page for a complete schedule of events for the UCSB Reads program, and please join us! UCSB/SB Reads is a collaborative effort of the UCSB Libraries, the Santa Barbara Public Library System, the Santa Barbara City College Luria Library, Patagonia, and UCSB Arts & Lectures. Page maintained by: "UCSB Reads" Library Committee.